"A must for those who want to jumpstart their learning of SOA. A great starting point in SOA for any IT architect, designer, or developer." "What a monumental achievement! This book provides practical insights into next generation SOA for practitioners and newbies. It is a must-have compendium for anyone in the field of SOA." "SOA makes the world go round! Even more so, with the recent explosive growth of cloud computing and the billions of connected devices and apps. Next Generation SOA gives excellent, practical guidance on envisioning, architecting, and designing innovative service-oriented solutions in this new, always-online era." "This is the perfect book for anyone who wants to refresh or get a handle on the foundations of SOA without delving into the deep technical details and implementation specifics. By working from the principles, the book shows how the SOA concepts and goals have matured, influenced, and grown with technologies such as master data, virtualization, and cloud. The book points to other volumes in the series for the depth of detail and technicalities, allowing you to get the broad picture view without any vendor coloration." "Next Generation SOA elucidates the foundational principles of service-orientation in a concise and insightful manner. The core concepts presented within its pages are indispensable for gaining the insight and understanding to become a competent SOA practitioner. This book will be an invaluable guide as I continue my journey along the service-orientation path." "An excellent source for next generation SOA architectural patterns and solution orchestration, reflecting the perceptual mapping and processing of business patterns in alignment with the emerging technological transformation holistically." --Ahmed Aamer, Sky Computing Pvt. Ltd.
"Whether you're a business decision maker or technologist, this book is a great read for those needing to grasp the complexities of SOA and its evolution to today's emerging architecture landscape with real scenarios demonstrating the application of service-orientation." "A power-packed introduction for newbies and a great reference for SOA practitioners. This book does it all and explains further in a concise manner the relevance of the service-orientation design paradigm for next generation architectures." "This book is a clear, concise, and very concentrated resource for relevant vendor-neutral service principles and technologies, for API and cloud, and definitely beyond. What I like especially is that this is finally a book that incorporates the heritage of the SOA Manifesto to complement the traditional theoretical approach that many books expose, with real-life mechanisms to bring balance (choosing the right priorities) to the decision-making involved with service architecture and service-orientation." "The SOA landscape is changing so fast. With cloud, mobile, and social media so prevalent today, the conversation about SOA needs to go beyond the basic web service. In Next Generation SOA, Erl and his team explore the new frontier and introduce the technologies we all need to leverage to stay agile in this fast-paced IT world, which is really what SOA is all about!" "This book gives a clear overview of what makes SOA stand out now and in the future, while at the same time putting focus on those details that matter. This makes it not only a perfect starting point for novice people in our field, but also a great companion to the other books in the Prentice Hall Service Technology Series from Thomas Erl for the more experienced SOA professionals. "Finally, its relatively small size and price make it an ideal give-away present to those who may not be directly involved in SOA projects but still are or should be interested in the subject at hand." "Get an overview of how the SOA landscape has changed recently due to the advent of virtualization, cloud computing, big data, and mobile computing. Without getting into the intricacies of implementation, it provides a quick walk-through of concepts required for executives and IT professionals for their next SOA initiative." "Next Generation SOA offers a fresh perspective on core SOA design and technology topics and affirms their relevance for modern industry operating models. It is a must-read for any enterprise looking to maximize existing or future investments in SOA technology." "As I started reading Next Generation SOA, I went through a personal confusion in the contradiction I felt between 'Next Generation' and the fact that the book is a 'Concise Introduction to Service Technology & Service-Orientation'. I found that contradictory until it clicked: The next generation SOA is an SOA that has freed itself from its initial dependence on vendor platforms. From then on, it all made sense. As an SOA Certified Professional I have found repeatedly, in the multiple workshops I have led, that there is a loud cry for an SOA workshop for IT top management. Analysts and architects all complain about the same thing: Top management just does not understand SOA and thinks it is just a new coat of paint on an old building. "Well, this book fills this gap to a high extent: It is short and concise enough to be read by decision makers but gives enough basic concepts on many aspects of SOA to actually understand why things in the IT department--and in the business--just will not be the same. "The case study at the end of the book--mainly oriented at legacy issues but useful even for eGov--is superb and will give enough material for study and discussions to a generation of SOA analysts, architects, and governance specialists. It even covers SOA governance nicely. "Just the book you needed for your boss's birthday." "Nowadays, various web-based service technologies have expanded and emerged, offering options to industry practitioners to choose the best-fitting technology for their organization. This book helps you to understand and find out in a comprehensive way the variety of emerged service technologies, along with their importance, key elements, and how service-orientation became the fundamental pillar. 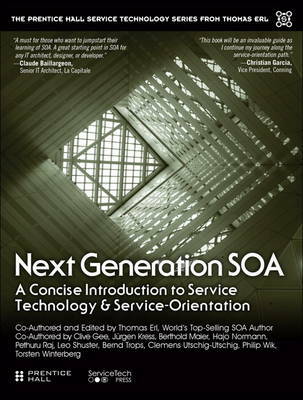 This remarkable book, Thomas Erl's Next Generation SOA: A Concise Introduction to Service Technology & Service-Orientation, is an accurate and complete reference of knowledge for those who are passionate to explore and exploit the latest emerged service technology." "I recommend this book both for SOA professionals who want to keep abreast of market trends and for professionals who wish to have their first contact with this universe. It is a very enriching and enjoyable reading." "Very good job on publishing/divulging these innovative concepts. As with Thomas Erl's previous SOA books, this one will help people gain a better understanding of the need for service-orientation (not only in IT, but in every aspect of work life)."